In September and November 2013, Mt Sinabung in Kabanjahe region erupted, forcing thousands of nearby residents to evacuate. In March 2014, A New Vision’s team went to those refugees camps and screened over 1,000 refugees. What we found was quite astounding! There were many old people over the age of 70 and 80 but their sights were still very good. We could only draw the conclusion that because they are farmers who see greenery all the time and eat green all the time. It is very common to find farmers from Kabanjahe at markets snacking on carrots while they are waiting for customers. We did not find any cataract blindness from around 1,500 refugees. 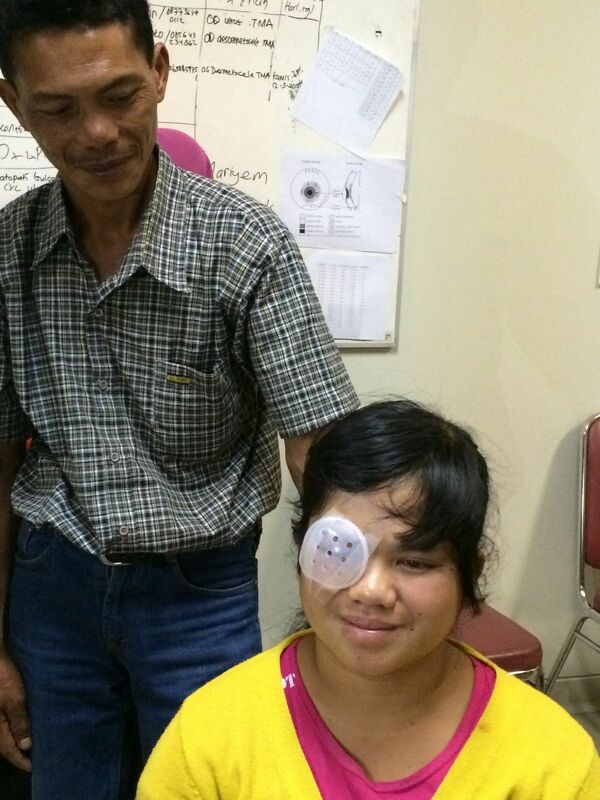 What we found was Megawati, a 16 year old girl suffering from cornea blindness (keratoconus bilateral). Mega could not see beyond 30 cm. We promised Mega we would notify her when there is a chance to get a cornea transplant. It is extremely difficult for patients in Indonesia to have cornea transplant opportunity. The waiting list is long and the cost is prohibitive for most. 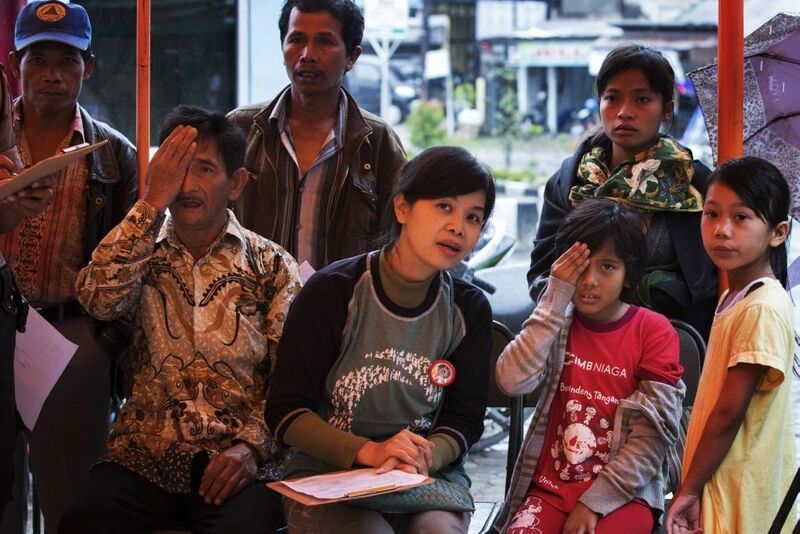 Eye banks in Indonesia are not doing well, lack of awareness means very few people donate cornea. Anyone who needs cornea has to buy from overseas, mainly from the Philippines or USA and it costs a few thousand dollars before the cost of transplantation. 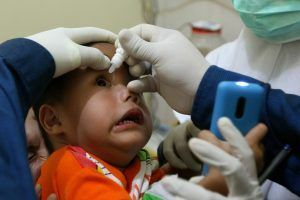 Nine months later, Dr. Reeta Gurung, cornea transplant expert from Tilganga Institute of Ophthalmology was invited to come in March 2015, to give a lecture and demonstration at the University of Gajah Mada Yogyakarta. She would bring with her 8 corneas. We went through our file and found Mega’s numbers. But alas, the numbers were no longer in use! We knew that most refugees had not returned home but many have shifted camps and it would be like looking for needle in a haystack finding one refugee among 6,000. It took a month to locate Mega, with great effort by volunteers ST, Abadi Ginting and his wife Rita Tarigan who searched for her from one refugee camp to the next. A New Vision paid for Mega and her dad’s flights and accommodation to Yogyakarta, they could not have afforded the trip. At the refugee camp, her dad worked at nearby farms as hired labour, earning USD 3 on a good day and the job was not available on a daily basis. The event was not without a hitch, one day before Dr. Reeta was scheduled to leave Kathmandu, a Turkish airline plane crashed at Kathmandu airport (no casualties) and caused the whole airport to close. No one knew when the airport could re-open. Meanwhile, Mega and her dad were already in Yogyakarta. Extracted cornea have an expiry date. When the airport was finally reopened 4 days later, all flights were fully booked from the 4 days departure backlog. Persistence paid off, Dr. Reeta finally landed in Yogyakarta 5 days later than scheduled. Mega’s dad saw the whole transplant procedure on his daughter broadcasted via television from the operating room to the university’s lecture hall. He was completely fascinated by Dr. Reeta’s skill. It was more fine than embroidery work. Dr. Reeta’s suturing the donated cornea on his daughter’s eye was very impressive to Megawati’s Dad, he said “It was more fine than embroidery work”. The next day, when Mega’s patch was taken off, her heart sank. She still could not see. She was too broken heart to tell her dad and just stayed in silent. But when Dr. Reeta started wiping her eye clean, her vision appeared, like magic. 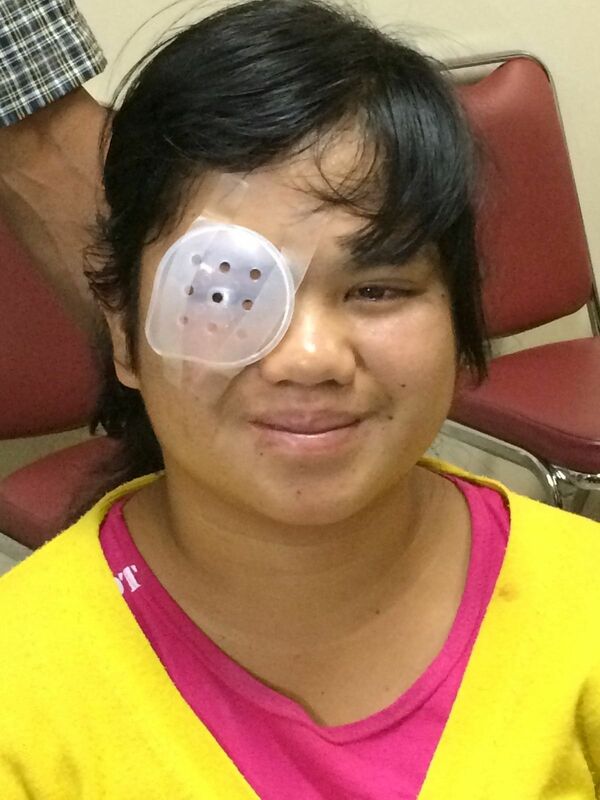 She could not see because medicated ointment was covering her eye. Mega now has a new life ahead of her.